While it may sound hard to believe, it appears the Canadian credit binge is slowly winding down. Canada’s household debt which currently sits at the highest among the 35 developed and developing countries the OECD group monitors, has reached an unfathomable 101% of GDP. It’s safe to assume any type of fall from the current sky-high levels won’t feel good. However, with the Bank of Canada raising interest rates, effectively tripling rates in less than a year, and regulators curtailing mortgage lending, we appear well on our way to a nasty stumble. Per the Bank of Canada, year-over year growth and the 3 month annualized pace of mortgage credit growth is at its weakest pace of growth since early 2001. 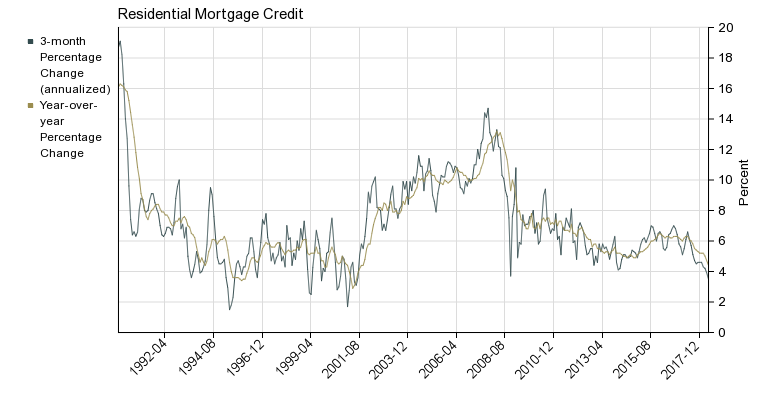 Recent mortgage data from CMHC also confirms mortgage credit and or the desire to borrow is in the dumps. Hence the sluggish and quickly evaporating liquidity in Canada’s housing market. In 2017, there were 959,074 new mortgage loans, a 6.5% decline across the nation. 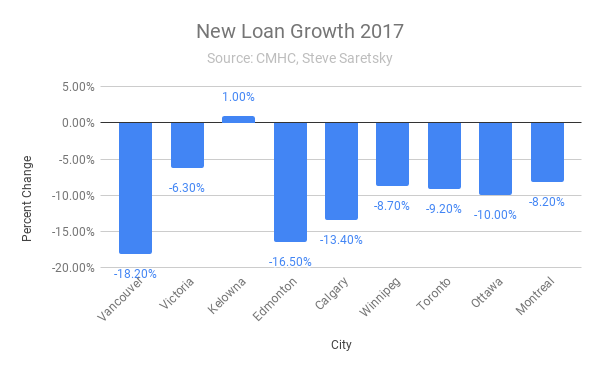 The slowdown was exacerbated in Vancouver where new loans collapsed by 18%. In Toronto new loans declined by 9.2%. 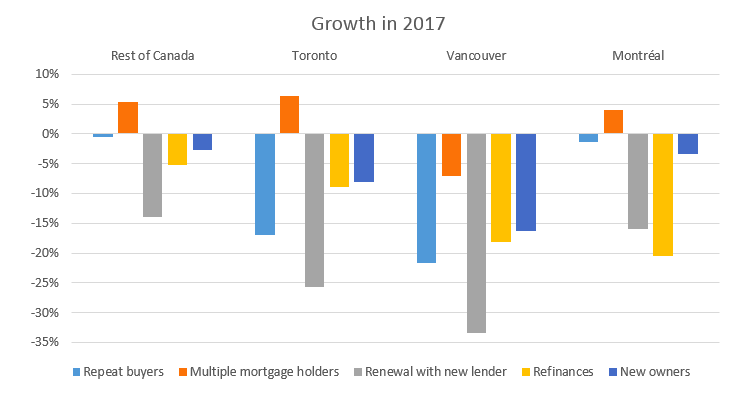 Loan Growth across Canada in 2017. 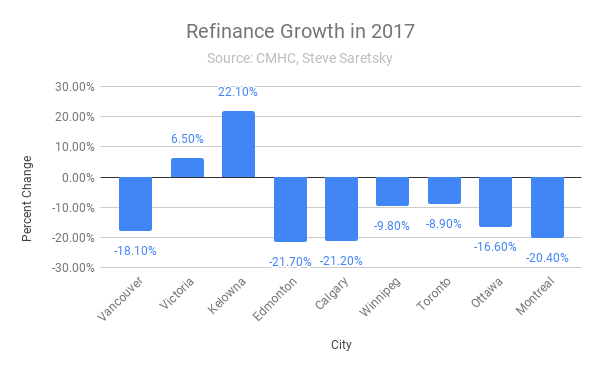 Across Canada, the number of refinances, mortgage renewals with a new lender, repeat buyers, and new owners all declined. The only category to increase was multiple mortgage holders. Mortgage refinances, which are often used to extract equity from one’s home, declined by 8.3% in 2017. In Vancouver they plunged 18.1%, and Toronto by 8.9%. This suggests homeowners lost some desire to leverage their property. Refinances were previously a popular option if a homeowner wanted to leverage an existing property for a downpayment on a second property. Renewals with a new lender also plunged steeply. This is indicative of new mortgage changes which require borrowers to undergo a stress test when switching lenders. This suggests borrowers are staying put with their current lenders. In Vancouver and Toronto, decreases in this category were larger than average, at 33.3% and 25.7%, respectively. While CMHC data covers approximately 85% of the mortgage market, it should be noted that this doesn’t include Canada’s booming private mortgage market which would surely increase the number of new owners, repeat buyers, and multiple mortgage holders. The private mortgage space is ultimately the end of the road for Canadian households.